Where the Dead Come To Life. We have no control over death. However, most of us have some say about our last resting place. From Potter’s Fields to the Pyramids, we have been as creative in housing the dead as we have in housing the living. It is this fascination with the tombstone, vault or burial plot, and our never-ending curiosity about its inhabitants, that intrigues every visitor to a cemetery. This 26-part, half-hour series explores the residents, history, art and mystique of the most renowned cemeteries of the world. From the glamour of Hollywood Forever to the gloomy, tangled romanticism of London’s Highgate, each cemetery has its own story of how it came into being. The intriguing history of the cemetery itself will be the backdrop to the exploration of its most fascinating residents. It is the residents themselves that, long after their death, will bring this series to life. Pere LaChaise – Paris, Highgate – London, Hollywood Forever Cemetery – Los Angeles, Cities of the Dead – New Orleans, Necropolis Cristobal Colon – Havana, Zentralfriedhof – Vienna, Graceland and Mount Carmel – Chicago, Cathedral Santa Croce – Florence, St. Peter and Paul Cathedral and Tikhvin Cemetery – St. Petersburg, Mount Pleasant – Toronto, Woodlawn Cemetery – New York, Prospect Cemetery – Dublin. Sarah Berndhart, Isadora Duncan, Moliere, Edith Piaf, Victor Noir, Oscar Wilde, Jim Morrison, Karl Marx, James Holman, George Wombwell, Jayne Mansfield, Tyrone Power, Douglas Fairbanks, Peter Lorre, Peter Finch, Rudolph Valentino, The Voodoo Queen, Louis Prima, Michael Collins, James Joyce, Christy Brown, Barry Sullivan, Jose Capablanca, Amelia Goyri de Adot (La Milagrosa), Al Capone, Dion Charles “Deany” O’Banion, The Genna Brothers, Bloody Angelo, Mike the Devil, Michaelangelo, Niccolo Machiavelli, Gioacchino Rossini, Galileo, every Czar from Peter I to Alexander III, Dostoesvsky, Tchaikovsky, Frederick Banting, Charles Best, Glenn Gould, Titanic survivor Arthur Godfrey Peuchen, Bat Masterson, Otto Preminger, Barbara Hutton, Ludwig van Beethoven, Wolfgang Amadeus Mozart and Antonio Salieri. R.I.P. 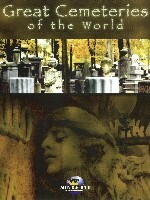 Great Cemeteries of the World is a co-production of Minds Eye Entertainment and Souleado Entertainment. Producers are Josh Miller and Connie Edwards; Kevin DeWalt is Executive Producer. Written by Fred Yackman and Shauna Fraser. The program is also formatted into Two 60-minute specials entitled Celebrity Gravesites and Celebrity Secrets.